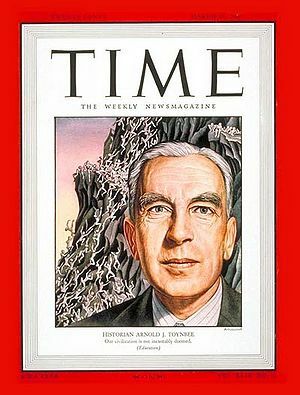 Arnold J. Toynbee (1889-1975) was an English scholar in international relations and a historian of the world who was influential in the 1950s. He is best known for his 12-volume, A Study of History. Toynbee examined extinct and existing civilizations (rather than nations) as the fundamental unit of historical study. He noted that civilizations could rise directly out of primitive life or be "affiliated" with a parent civilization. Educated at Balliol College, Toynbee was Koraes professor of Byzantine and Modern Greek language, literature, and history at London University, (1919 to 1924) and from 1925 until his retirement in 1955 he was director of studies in the Royal Institute of International Affairs and research professor of international history in the University of London. During the Second World War he was director of the research department of the Foreign Office. He published many scholarly books, including The Western Question in Greece and Turkey (1922) and Greek Historical Thought (1924); from 1920-46 he edited the annual Survey of International Affairs. In 1936-1954, Toynbee's ten-volume A Study of History came out in three separate installments. He followed Oswald Spengler in taking a comparative topical approach to independent civilizations. Toynbee's said they displayed striking parallels in their origin, growth, and decay. Toynbee rejected Spengler's biological model of civilizations as organisms with a typical life span of 1,000 years. Of the 26 civilizations Toynbee identified, sixteen were dead by 1940 nine of the remaining ten were shown to have already broken down. Only western civilization was left standing. He explained breakdowns as a failure of creative power in the creative minority, which henceforth becomes a merely 'dominant' minority; that is followed by an answering withdrawal of allegiance and mimesis on the part of the majority; finally there is a consequent loss of social unity in the society as a whole. Like Ssu-ma Cheng-chen, Toynbee explained decline as due to their moral failure. Many readers, especially in America, rejoiced in his implication (in vols. 1-6) that only a return to some form of Catholicism could halt the breakdown of western civilization which began with the Reformation. Volumes 7-10, published in 1954 abandoned the religious message and his popular audience slipped away, while scholars gleefully picked apart his mistakes. Toynbee pointed out that Ancient Egypt had no predecessor or successor, contradicting the fashionable idea that Egypt was the cradle of civilization. He also posited a possibly unique sort of relationship with the Greco-Roman Civilization and Western Christendom, predicting that the West would assimilate the Far East, Hindu, and Islamic civilizations. This page was last modified on 19 March 2018, at 12:03. This page has been accessed 7,896 times.